So while at the dealer today for my wife's bike, I was asked if I had the recall done on my Gsxs. Apparently they are experiencing leaky brembo calipers and from what I was told dealers in the US are replacing both front calipers. They ordered mine and also told me there is a stop sell on new bikes in the US. Not sure if this will be world wide or only on US models. Have not heard anything abut the Canadian bikes. I am sure we are not far behind. I will be checking tomorrow. Legends are measured in years not seconds. Nothing on the UK DVSA site for our bike. It was a narrow band of bikes within a VIN range. Mine was not in that range. Does anyone know the VIN #'s affected? Suzuki Motor Corporation has instituted a safety recall campaign to replace the front brake calipers. The supplier of the calipers applied a surface treatment to change the color of the brake caliper body. Due to insufficient sealing, some treating liquid may have entered the brake piston cylinder, damaging the surface of the brake piston seal groove in the piston cylinder. This condition can cause brake fluid leakage. To ensure customer safety and satisfaction, dealers will replace the front brake calipers. My VIN was within the range and they say that parts should be available for ordering this coming week. My F's VIN ends in 00097 but each model (Naked w/ or w/out ABS, faired, California market or not) are each considered different models so it'll be hard to map this out. Attached is the VIN decoder from the service manual. 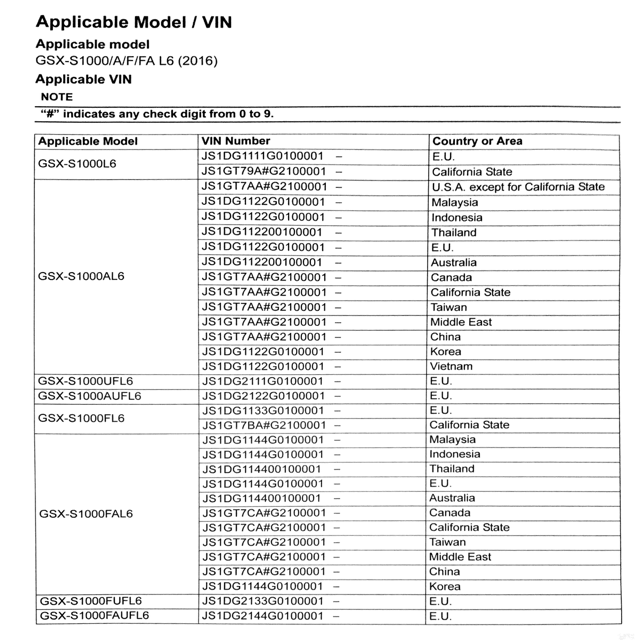 It is not the list of VINs covered by the recall. Last edited by Gregg; 11-21-2015 at 01:08 PM. The US and UK Suzuki sites have VIN checkers which show updates within the last 48 hours. Id imagine owners in those countries will get the answer they are looking for. Recall Description: The supplier of the front brake caliper applied a surface treatment to change the color of the brake caliper body. Due to insufficient sealing, some treating liquid may have entered the brake piston cylinder, damaging the surface condition of the brake piston seal groove in the piston cylinder, which can result in brake fluid leaking from the brake calipers. Safety Risk Description: Brake fluid leakage can result in reduced braking performance, increasing the risk of a crash. Repair Description: Suzuki dealers will replace the front brake calipers of affected motorcycles. Detroitdawg and JeffroGymnast like this. Last edited by Gregg; 11-23-2015 at 01:29 AM.